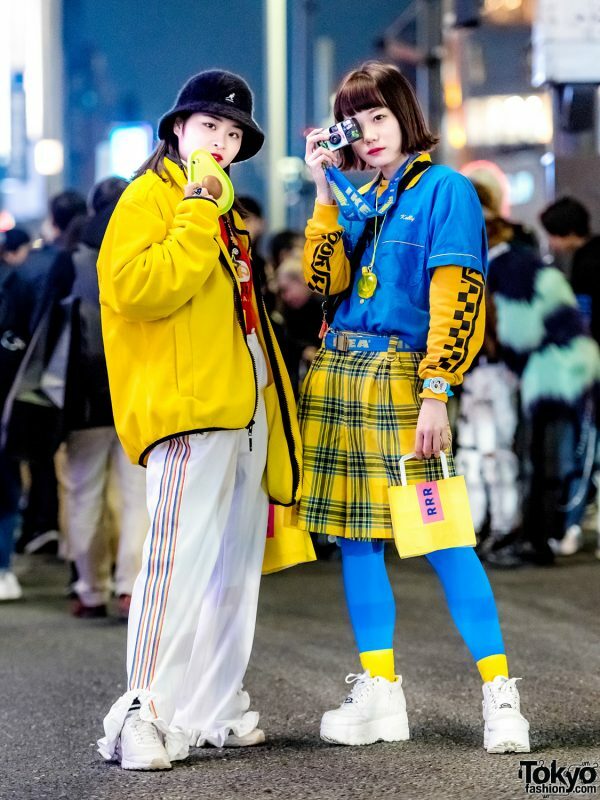 Bringing major doses of color on the streets of Harajuku were 17-year-old students Okusako and Saya. On the left is Okusako in a bright yellow Pinnap jacket with a front zip closure and contrasting black piping. 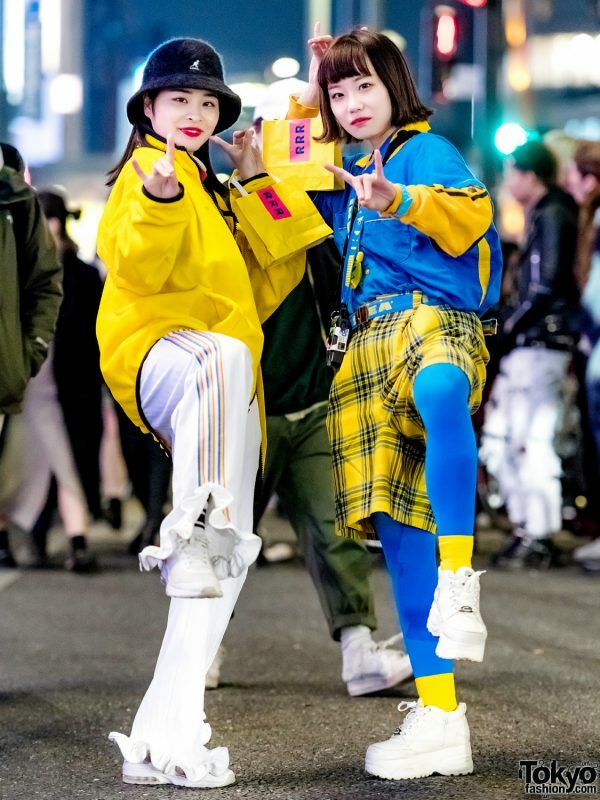 She wore it over a red ribbed graphic top from San To Nibun No Ichi, which she tucked into white Kinji track pants with multicolored stripes on the sides and ruffle hems. Strapped across her chest is a black fanny pack with a multicolored graphic print from RRR by Sugar Spot Factory. 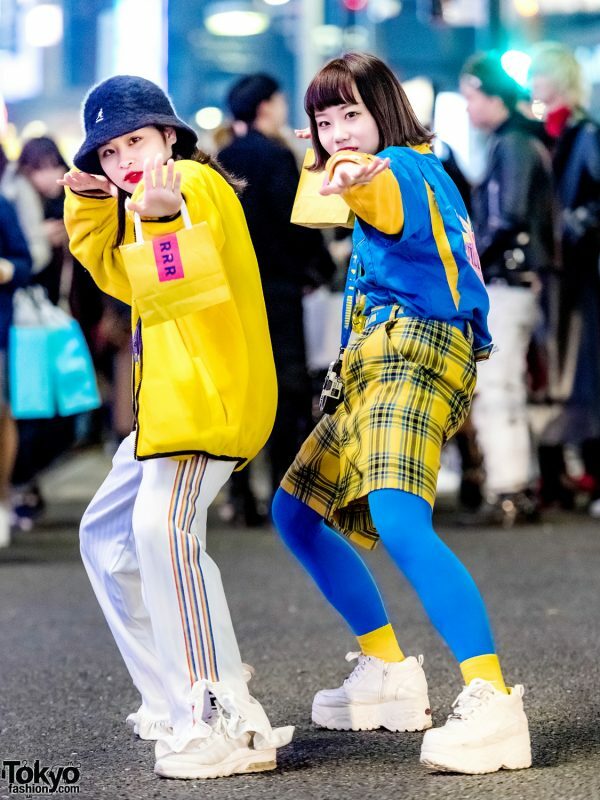 Okusako completed her look with a black furry bucket hat from Kangol and Nike sneakers. 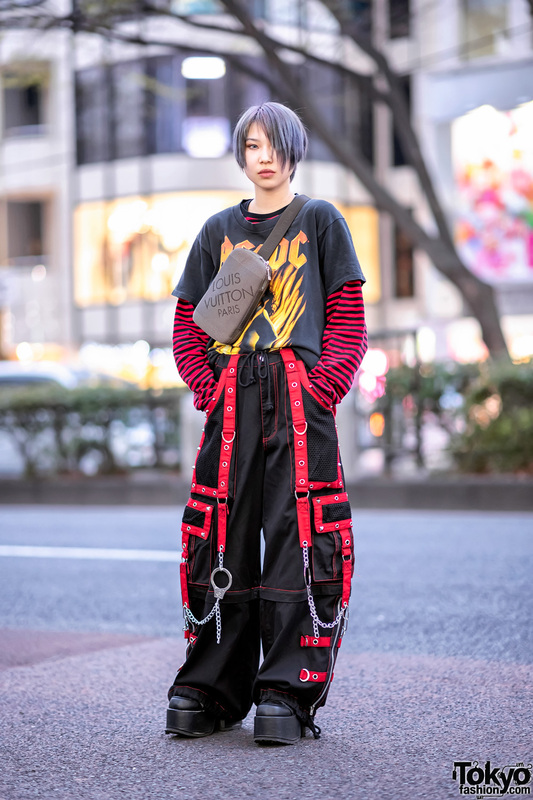 She enjoys shopping at San To Nibun No Ichi and listening to music from One Direction. Follow Okusako on Instagram and Twitter. 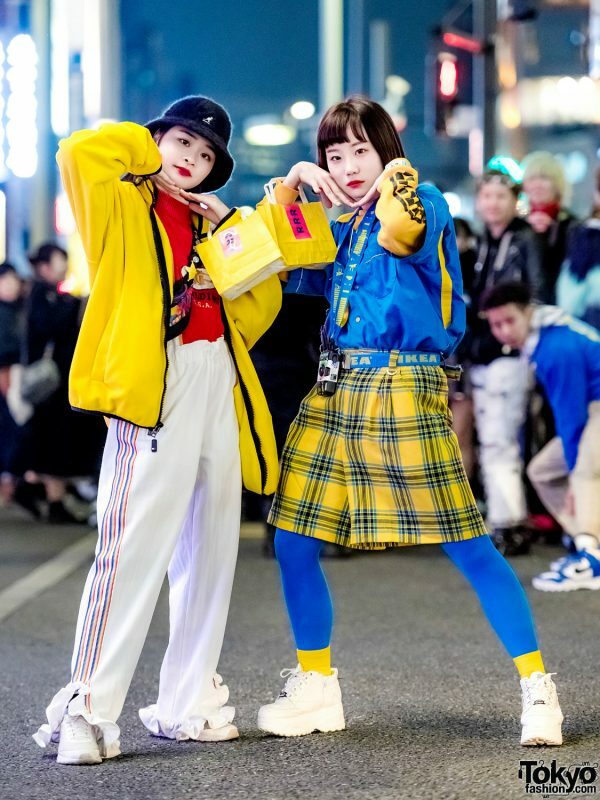 Meanwhile, Saya stepped out in a blue-and-yellow ensemble. She wore layered tops from Pinnap and H&M, which consisted of a blue shirt and a yellow sweater with black graphic print. 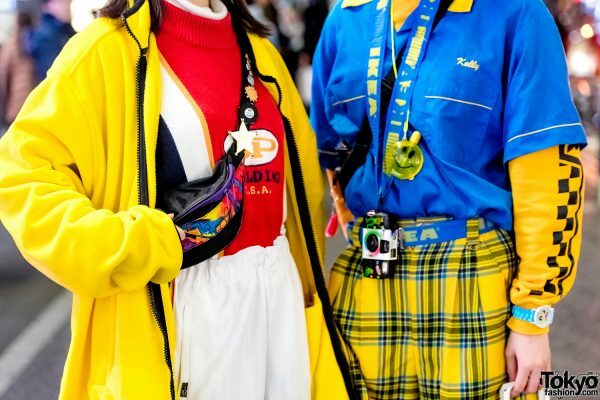 Saya styled them with yellow-and-black plaid shorts from Kiki2, which she cinched at the waist with a blue belt. 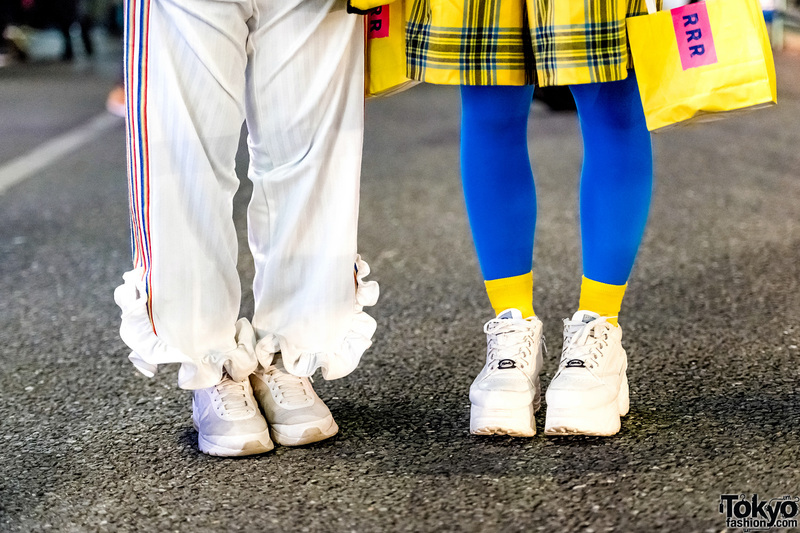 She wore them over bright blue tights tucked into bright yellow socks and Yosuke white platform wedge sneakers. An Oh Pearl bag and accessories from Spiral and Thank You Mart finished off her look. Saya’s fashion favorites include Kiki and Oh Pearl. She also listens to music from Justin Bieber and is active on Instagram.